I've had a love affair with blush since I was a little girl. Clown cheeks were my specialty during dress up time and I rocked the brightest pink shades. Fortunately for everyone around me, I've toned things back a lot since then and have a much lighter hand. Blush still is a favorite in my makeup routine and there are five blushes I gravitate towards more than anything else. I'll throw it back to my younger days with this first blush. Everyone needs that bright pop of pink in their collection. Tarte's "Fearless" has been my go-to for the perfect flush of pinky goodness. Tarte is the brand I compare all blushes to for quality, pigmentation, and lasting power. They're just that good. The IT Cosmetic's Bye Bye Pores Blush in "Sweet Cheeks" is the newest addition to my collection but instantly became a favorite. 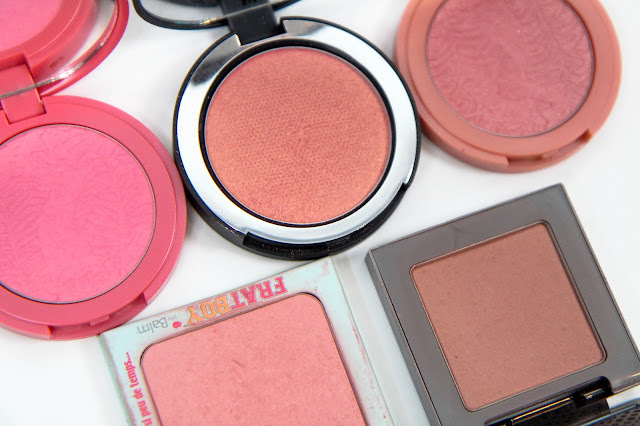 It's unlike any of the other blushes I've owned so it had to be included in this roundup. It's packed full of glitter, but creates this gorgeous iridescent glow on the skin. Slightly on the mauve side, this blush is a fantastic transition from summer to fall makeup as it accentuates whatever tan I managed to get this summer while packing on the dewy radiance. Of course another Tarte blush had to be added to the lineup. No shame. "Peaceful" is a much more neutral shade I tend to wear on light makeup days to add a little bit of dimension to my face. It also has bits of glitter in it, but they never translate to the skin. Just a good ol' fashion peachy blush shade good for all year round. theBalm's Frat Boy takes "Peaceful" and injects it with a bit of "Fearless" and probably is my oldest blush. I can't ever seem to part with it though as it's still going strong. The best summer peachy shade to add warmth to the skin while looking natural and effortless. It's oh so good. Urban Decay's "Video" blush has been sitting quite on my shelves this summer waiting for its time to shine once fall and winter roll around. It's the best colder month blush I've found for adding color back into my skin without looking too out of place on my pale winter face. It can be worn lightly or really built up to its fullest potential. These five blushes cover all the bases, You'll never be without the perfect shade and your blush collection will thank you for keeping it to a minimum. They're all incredibly pigmented, long-lasting, and downright gorgeous. Add two or all of them to your collection. Go on, I won't tell.